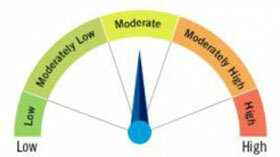 The product attempts to generate moderate risk adjusted returns by focusing exclusively on matured businesses. 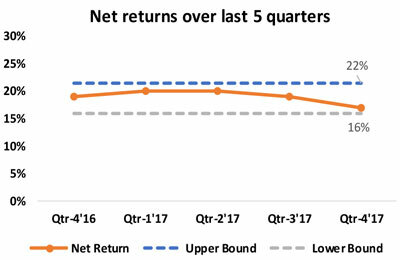 Matured business borrowers have delivered moderate net returns (post default) consistently over the last 5 qtrs. Our historical data suggests that borrowers with business stability of more than 5 years belong to the low risk category and are consistent in their repayments and hence become a sure bet for lenders to invest. Currently, approximately 30-35% of borrowers funded on our platform have their old business set-up. ₹1 lakh invested in this product will deliver the following returns over 18-24 months. Below charts give the distribution of all matured business borrowers on the platform on their bureau scores (based on their loan repayment history), their monthly income & their monthly fixed obligation to income ratio.